Hot on the heels of Anthem and Express Scripts as they work to curb the opioid epidemic, CVS Health announces restrictions on coverage for certain opioid doses and durations. The Caremark unit of CVS is one of the largest pharmacy benefit managers, covering nearly 90 million patients. Starting in February, patients requiring short-term opioid therapy will be limited to seven days of medication. I was surprised to learn that some patients with short-term pain needs were receiving 20-30 day supplies of medication since I don’t see a lot of that prescribing behavior in my community. Patients requiring long-term treatment will be limited to a dose of 90 morphine milligram equivalents. Patients must also demonstrate that they’ve been treated with immediate-release medications before they will be allowed to fill prescriptions for extended-release medications. Physicians will be able to appeal the restrictions through a prior authorization process, and employers and insurers can opt out of the restrictions. They’re basing the restrictions on recommendations from the CDC, issued last year. CVS is also adding medication disposal units in 750 of its pharmacies. The healthcare IT season is starting to heat up, with the Epic user group underway and the Cerner conference approaching. From a vendor standpoint, the buzz ebbs and flows until it reaches its apex at HIMSS, but I’m starting to see some activity among health systems and larger medical practices. Maybe it’s the potential relaxation of some of the regulatory burdens that people were anticipating, or perhaps there are other forces at play, but groups seem to be talking about making technology and systems investments when they had previously been keeping their purses closed. I’ve been asked to give input on a couple of RFP documents, which could result in some large purchases that I didn’t see happening in the next couple of years. It could also be that organizations want to use the relative regulatory lull to get ready for any future crushes. I’ve worked with a couple of groups that have done rip-and-replace system transitions across reporting periods and shifting regulatory requirements, so I agree it’s smart to move things forward now if you think you’re ready to make a change. 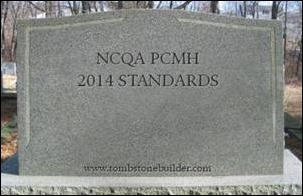 I’m not mourning the demise of the 2014 NCQA Patient Centered Medical Home Standards, which are nearing their end. Practices who had already purchased the 2014 survey tool can use it through September 30, but after that, organizations have to transition to the 2017 standards. This has been a confusing time for many of my clients and I’m certainly looking forward to being able to support groups on a single set of standards. Patient-Centered Medical Home efforts continue to get quite a bit of attention, even for practices that aren’t trying to maximize their payments under MIPS. I’ve been trying in vain to contact a colleague in Puerto Rico, not only so I can know that he’s OK, but also to ask if there is anything I can do to help other than sending money. The reports I’ve seen are personally heartbreaking and professionally unfathomable. A week after Hurricane Maria’s landfall, most of the island is still without power, including more than 50 of the island’s hospitals. A little more than half of the residents have access to drinkable water. The hospitals that are still open are running on generators and attempts to connect them to the power grid have resulted in a few hours of success followed by a return to the generators. Patients are seeking emergency care in larger numbers than facilities are prepared to handle — partly due to water, power, and supply shortages — but also due to the fact that many facilities are also damaged and unable to operate at all. Those facilities that are able to run are not at full staffing levels and surgical case volumes are limited. Some descriptions liken it to a war zone, with healthcare providers making due with whatever then can find. It sounds like pharmacy stocks are holding out, although there are glitches with electronic payment systems and technology infrastructure. 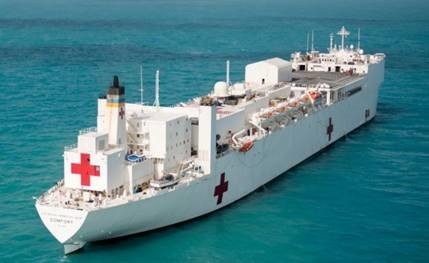 Patients are being evacuated to Louisiana and South Carolina, with the Navy’s hospital ship USNS Comfort expected to arrive next week. The Comfort is no stranger to natural disasters, having been on station in Haiti following the 2010 earthquake and in the Gulf of Mexico following Hurricane Katrina in 2005. It can staff up to 1,000 hospital beds and has 12 operating rooms. Still, patients with critical needs, such as open heart surgery, are being encouraged to travel to the continental US for surgery, although travel off the island remains an issue. The Department of Health and Human Services has relaxed rules on physician licensure, allowing physicians to practice in the emergency area under an unrestricted license from another state rather than requiring them to be licensed where services are rendered. HIPAA penalties are also being waived with regard to distribution of privacy practices documents and sharing medical information with family members. It could be six months before power is fully restored and the needs will be great to combat public health crises related to the storms and flooding. The One America Appeal, originally launched by the five living former US Presidents to support recovery from Hurricane Harvey, has been expanded to include areas devastated by Irma and Maria. Donations will go to a fund managed by the George H. W. Bush Presidential Library foundation, which will distribute them to existing disaster relief funds supporting affected areas. The Foundation will ensure that 100 percent of donations will go to hurricane recovery, and donors can specify which recovery effort they want to support, if desired. I’m hoping I hear from my friend soon and that he and his family are safe.